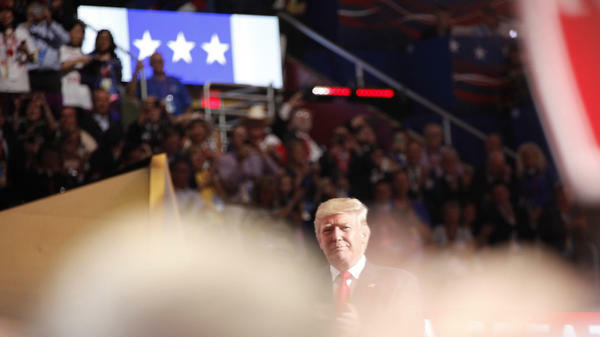 GOP presidential nominee Donald Trump speaks during the final night of the Republican National Convention in Cleveland. It's not often — if ever — that presidential nominees use footnotes in their acceptance speeches. But Thursday night, Donald Trump used 282 of them in the written version of his acceptance speech — to bolster what he promised would be a presentation of the "facts plainly and honestly." I was footnote No. 145. Trump told the members of the Republican audience that if they wanted to hear "the corporate spin, the carefully crafted lies and the media myths" they should go to the Democratic convention. But then almost all the footnotes he used relied on articles from the mainstream media — The New York Times, CBS News, CNN, Forbes, NPR — the very people he had just criticized. Trump talked a lot about rising crime, for example: "Homicides last year increased by 17% in America's fifty largest cities. That's the largest increase in 25 years. In our nation's capital, killings have risen by 50 percent," he said. The source? The Washington Post — the media organization Trump called "phony and dishonest" not long ago, before banning the paper's political reporters from his campaign. The Post article did find a one-year increase in homicides, looking at preliminary statistics for 2015. What Trump didn't say is that the Post also found that "twice as many people were killed in those 50 cities in 1991." The article's author, Max Ehrenfreund, quickly tweeted a copy of a chart after Trump's remarks. It showed a dramatic drop in homicides over the past 25 years, with a slight upswing at the end. "Here's that 17% increase he mentioned," Ehrenfreund explained. Then a colleague alerted me that one of my stories was also cited. It was for the part where Trump talked about how "the system is rigged against our citizens, just like it was rigged against Bernie Sanders — he never had a chance." Did one of my stories say that? I didn't think so. So I went back and checked. The piece cited was about voter confidence. It did mention Trump's claims that the system was "rigged" and said how such claims had left many voters uneasy and confused about the process. But it also noted that the overwhelming majority of voters usually have no problems at the polls and are confident their votes are counted correctly. I also checked out footnotes 146 and 147, just to be sure. They were also cited in the same paragraph. Those two stories — by the Washington Post and ABC News — referred to complaints by Sanders supporters that the Democratic Party's superdelegate process was "rigged." But both stories then went on to largely debunk those claims. The good news, though, is that with all those footnotes, people can check it out for themselves.